Well, maybe that’s a slight exaggeration. Especially moving wood when it’s mizzling that very wet Normandy mizzle that falls out of a grey sky. Still, that can be Normandy in February. And often is. So, we’re in the middle of clearing a particularly vigorous crop of last year’s brambles from the bottom of the drive. Some of the brambles necessitated moving a small pile of wood in order to dig out the bramble roots. Moving the wood unearthed a couple of “treasures”. Some of the bark was flaking away from a couple of old stumps and underneath I spotted this little fellow. Taking advice from Chris Luck on the invaluable PlanetePassion website, I now know it is a Palmate newtlet. 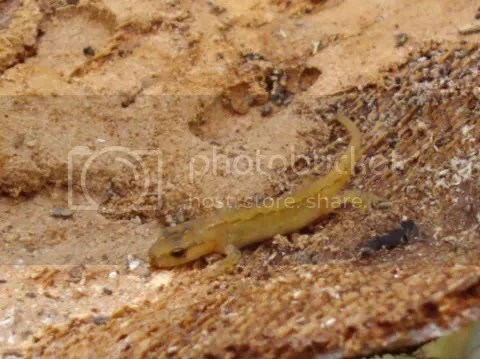 As it was also adjacent to some rocks on which common lizards sun themselves in summer, I wondered if it could be a baby lizard but for a number of reasons that Chris kindly explained, it is a newt. 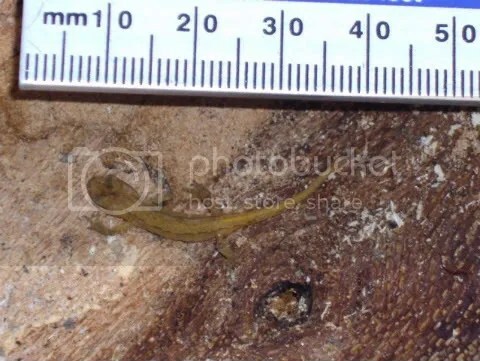 Size of newt’s head is wide in relationship to the body. A lizard’s head tends to be a similar dimension to the body. It didn’t run away while I was peering at it and photographing it! I’ll know what to look for next time. I did initially think it was dead, it was so still. But then I saw it’s eyes blink very slowly. It has been rehomed with the piece of bark and plenty of dry leaves in a woodpile that won’t be disturbed again this year. Palmate newts hibernate until early March and then get down to breeding. Eggs are laid onto aquatic plants and each egg is individually folded into a leaf or pond weed. Eggs take about 17 or 18 days to hatch into the tadpole or “eft” stage. Efts develop their front legs before their back legs – unlike frog and toad tadpoles. The efts breathe through feathery gills which sprout from behind their heads. The young adults emerge from the pond in August and September and hibernate through winter usually in deep piles of leaf litter. We may not have the most immaculate garden in the village but it’s easy to see that leaving piles of rocks, wood and leaf litter around the edges of the land is of real benefit to wildlife.